First test imaging was done in a bit of a hurry and by surprise, thus nothing worked and polar alignment was off by a mile. 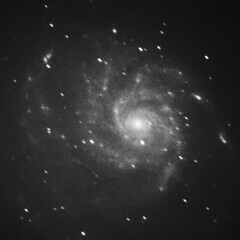 I'm still waiting for the filter wheel, thus didn't spend too much time trying to get guiding working, although it's clear I should've done so. But after all, the SXVR-H18 seems like a decent camera despite some rather dissappointing features, mainly the CCD distance from flange is a too long (around 24mm!) to allow using a filterwheel with SLR optics for widefield imaging.